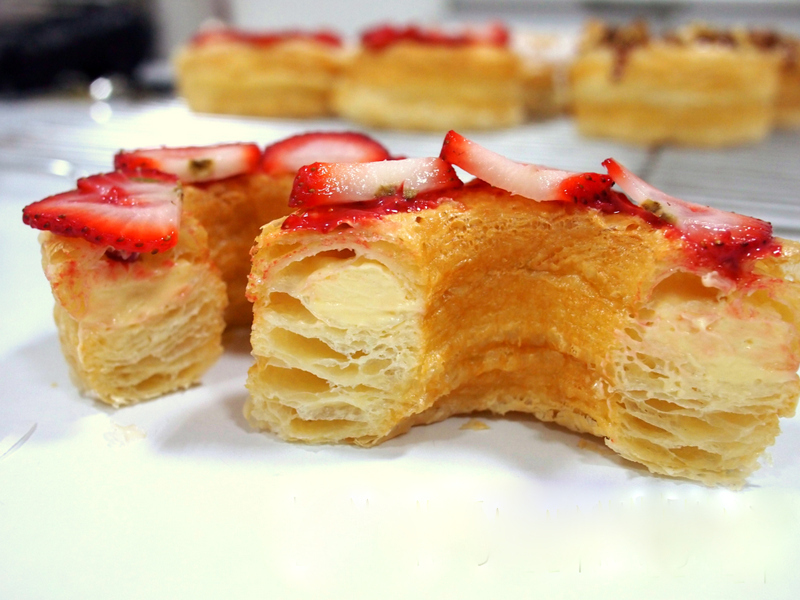 Dissecting the Cronut Craze at Dominique Ansel Bakery: How Do They Do It? Dissecting the Cronut Craze: How Do They Do It? If you haven’t heard of the Cronut, it’s the latest food trend in Manhattan. As the name suggests, it’s a hybrid croissant-donut crafted by Dominique Ansel Bakery in SoHo. This unique pastry made it’s debut in May, and it didn’t take long for word of its apparent awesomeness to spread. Now, the pastry has its own cult following, made up of hungry New Yorkers willing to wait hours in line for a tiny taste. So, how did this trend take off and why are people willing to wait in a miserably long line for a damn donut? I’ll tell you. They have a new flavor every month – May was Rose Vanilla, June was Lemon Maple, and July is Blackberry. Why is this a big deal? It keeps the same people coming back, while attracting new fans as well. If they made the same flavors every month, people would eventually try them all and say, “Forget that line. I’ve had them all.” But in order to try every flavor you have to keep coming back. And if the Cronuts are good – which they must be – not only will the same people come back, but they’ll tell their friends, and the lines will continue to grow. The bakery only allows customers to purchase two Cronuts at a time, at $5 a piece. That way, you can’t buy a dozen for your family or your office. If they want to try one, then they have to go to the bakery in Soho and stand in line themselves. It’s a way of driving continuous traffic. Made with a laminated dough which has been likened to a croissant (but uses a proprietary recipe), the Cronut is first proofed and then fried in grapeseed oil at a specific temperature. Once cooked, each Cronut is flavored in three ways: rolled in sugar, filled with cream and topped with glaze. Cronuts are made fresh daily, and completely done in house. The entire process takes up to 3 days. The bakery only makes between 200-300 per day, and even with a two-per-person limit, they go quick. So, the bakery encourages customers to arrive at least 45 minutes prior to opening (8am Mon-Sat and 9am Sun) in order to get one. And that still doesn’t guarantee you’ll have one. Most people say you have to be there at least 2 hours prior to their opening. But if they run out, they run out. However, if you’re willing to break the rules, you can sometimes purchase one from scalpers, who wait in line themselves, then sell the pastries to drive-up customers for up to $45 a piece. Yeah, that’s right. $45. This is a manufactured trend. The minds behind the Cronut craze thought long and hard before they released the first flavor in May. All of the above factors contribute to the success of the Cronut, and all of them were carefully planned and calculated. In addition to those factors listed above, the bakery also has a pre-order list that they open up every Monday at 11am, by phone only. They take pre-orders up to two weeks in advance, although currently, the website states that the list is full. And word on the streets is, it’s pretty hard to reach a human when you call. Most who attempt a pre-order get a busy signal or a “Mailbox is Full” message. Why don’t they add more phones, lines, and personnel? They don’t want to. It’s part of the plan. They also offer the option to place a large order, which must be over 50 Cronuts. They need one month’s advance notice, and currently, you can’t get on this list until September, but even a large order is not a guarantee. You need to get your September order in through email (info@dominiqueansel.com) on August 1st, starting at midnight. Of course, this is a first-come, first-served basis, so you have to stay up late that night to spend close to $300 on your Cronuts. Oh, and you better be really freaking hungry, or planning a Cronut party, because the bakery cautions that Cronuts have a very short shelf life. Even further, you should have your phone glued to your hip, because they’ll only call twice to confirm your order. If you don’t answer the second call, they’ll move to the next order on the list. All of this begs the question: what’s the best way to get one or two Cronuts at a reasonable price? You need to stand in line. Why? Because they want you to. 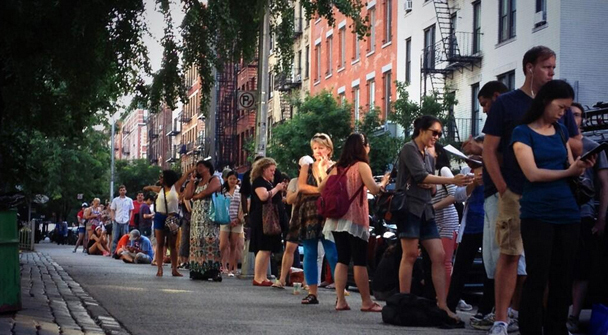 They planned for these lines because they help with the Cronut’s publicity. Why pay for an advertisement that says your product is good when you have thousands of people giving up precious time to wait for it? I think that says enough, and I believe the bakery would agree with me.